Birth of a Beauty – cute, but poorly edited. Han Ye Seul is always adorable and has lots of screen presence, and she’s well cast as a naive, overweight woman who is presumed dead in a car accident after finding her husband cheating, and undergoes plastic surgery to become a gorgeous model. But every single part of this plot has been done ten thousand times before, and the pacing, cinematography, and music are all muted and underwhelming. Also she and Joo Sang Wook have surprisingly little chemistry so far – given the situations the drama has placed them in, including lots of physical contact, their chemistry should be clear and growing, and four episodes in it’s barely manifested. 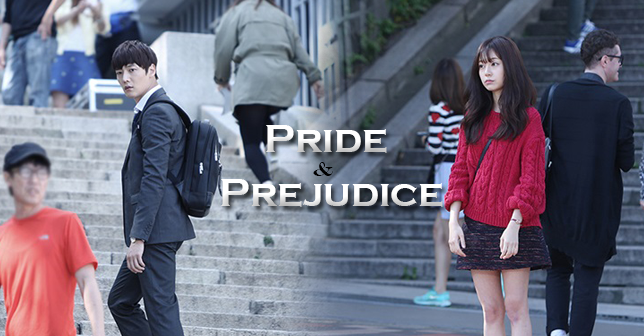 Pride and Prejudice – I’m generally a sucker for exes who fall back in love, since there’s so much built-in chemistry and romantic tension and they already know each other well – but Choi Jin Hyuk has played this same role in a much better drama, the sparkly, addicting Emergency Couple in which he and his ex-wife fall back in love with each other. Here, he and Baek Jin Hee plays characters who dated some time back and are now prosecutors in the same office. Jin Hee is cute but at least so far has no particular screen presence or chemistry with Jin Hyuk, and most bizarrely of all, the drama’s production values are low – the lighting is dark, picture quality isn’t sharp, and the music is muted and dull. It feels oddly low-budget. The plot is also wholly predictable, there’s no spark of any magic or sense of direction or vision that would give oomph to the cliched story. It’s pretty cute – it’s always easy to watch two characters slowly care about each other again – but wholly unexceptional. Watch Emergency Couple instead. Liar Game – this has an interesting plot and premise, but every time I watch it I get a strong sense of how much better the original must be, since generally Japan excels at this type of twisty mind-game small-screen story much more than Korea. Also, male lead Lee Sang Yoon has the face of an angel or a very pleasant college professor, so seems an odd choice to play the morally ambiguous genius brought to life by Matsuda Shoda in the Japanese version. Iron Man – I initially liked this, but it’s turned out to be no great shakes. Any drama that has the lead couple together – with affection admitted not just on one side but on both and officially dating – by a third of the way through is doing it wrong. As soon as the main obstacle faced by the couple became their income/class gap and the opposition of his family, it became yawn-worthy and dull – that plot has been killed stone-dead by thousands of dramas, and Heirs did the best job of it we’ll see in a while. Lee Dong Wook and Shin Se Kyung have a strong chemistry that kept me going through the first one-third, and there’s lots of potential here in the story of a man gifted/cursed with fluctuating superpowers of speed, strength, and iron blades that sprout from his back – but the drama had to drag the plot instead into boring class tension and Korea drama tropes. The premise is inventive and I do like this overall the best of the four dramas mentioned here, but that’s faint praise.